Walking in Your Power is Barbara M. Derrick’s debut book which was published in May 2017. It is a distinctive self-help book blended mindfully with a touching story. Barbara has previously co-authored a chapter in the book First Lady Nation (Vol IV). Let’s have a look what Walking in Your Power by Barbara Derrick has to offer to the readers. Walking in Your Power is divided into 13 chapters and the author has referred them to be the 13 sections on the back of the turtle. The complete title of the book is ‘Walking Your Power: Lessons from the Grandmothers’ as the book has a lot to offer especially for women. Muskwa, a young elder and the main character of the book, gets its name from the Cree word for Bear and the Barbara reveals that she is a spirit of her clan who came to her dreams. Every chapter carries a message that will help you through your spiritual growth and self-healing. Be it the lesson of looking into the past to understand the present fully or the simple act of forgiveness. Barbara talks about post-traumatic stress and also highlights how ancestral civilizations had methods to prevent it from passing from one generation to other. Muskwa began to understand how her psychic abilities, premonitions and experiences she had as a child were handed down to her ancestors through ‘DNA memory’. With the experiences of Muskwa in each chapter, the author tries to deliver the clear reflections of her thoughts for the readers. Each chapter plays a crucial role in helping the reader to move forward and liberate oneself from the past paradigms. Apart from imparting lessons for life, Barbara M Derrick has wonderfully integrated a workbook after each chapter. She encourages readers to actually solve their problems themselves. Some of her suggestions are writing a journal, making groups and activities that will help you to come out of the past, feel the present and change your future. 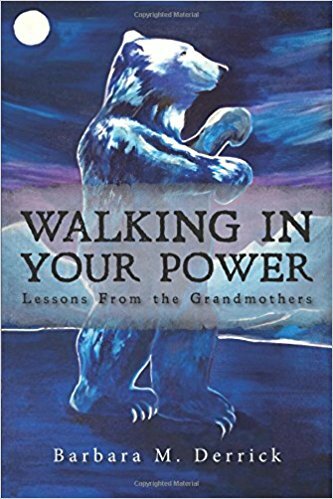 Walking in Your Power: Lessons from the Grandmothers is one of kind self-help book which also doubles as a workbook. Talking about writing style, the characterization is pretty unique which makes the storytelling somewhat beyond normal. If you are a deep reader, you will easily be able to relate to the author’s imagery. This book is surely worth a read to feel empowered and in fact healed to an extent. Grap Your copy of Walking in Your Power by Barbara M. Derrick on Amazon. A distinctive self-help book blended mindfully with a touching story. Born in Quesnel, Barbara Derrick has ten years of Social Work background and has been instructing Native traditional arts for 15 years. She is also building her Native Studio Art Cultural Institute with an aim to expand her passion in the arts, share her leadership training, and add value to others lives. Barbara’s debuted in writing with her book ‘Walking in Your Power’ published in May 2017.